Italian-inspired restaurant franchise Col'Cacchio has added an engaging element to their dining experience that would hold special appeal for their social media-savvy customers. Restaurants nationwide are now sporting interactive 'Instagram placemats' with guidelines on how diners can take the perfect shot to share with their friends on social platforms. Following the massive growth in popularity of Instagram, the brand wanted to create an element in their dining experience that would engage with their customers in-store and through their social media platforms. Recent research indicated that 18-35 year olds who actively use social media spend five whole days a year browsing food images on Instagram, and that 30% would avoid a restaurant if their Instagram presence was lacking. 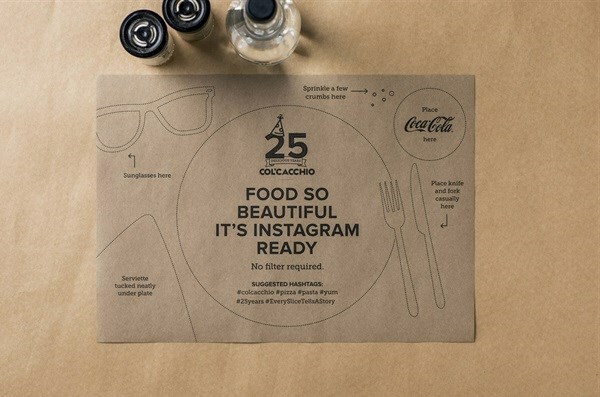 The new placemats provide guidelines on how to position your meal for a shot that is 'Instagram-ready'. They were introduced in honour of Col’Cacchio’s 25th birthday, as a way of taking the brand back to its younger, quirky days. "The nature of pizza eating goes hand-in-hand with conversation, stories and memories. Sharing stories and eating pizza is what life is all about," says the company. Col’Cacchio went through a massive rebrand late last year that included a new look and feel that is reflected in the interior décor, seasonally updated menu and new logo, bringing fresh life to their evolving operation. “Being an organisation that has always evolved with the times, our new corporate identity reflects not only our growth and position as an inclusive brand, but our innovative spirit,” says CEO Michael Terespolsky. Every touch point, from the take-away bags and pizza boxes, to the placemats and salt and pepper grinders are designed to point to the personality of the eating experience and "the welcoming nature of the Col’Cacchio family". As part of the makeover, the company has introduced a number of interactive elements to all their packaging. The new takeaway packaging sports Col’Cacchio’s new logo along with a charming story that takes customers on a journey. 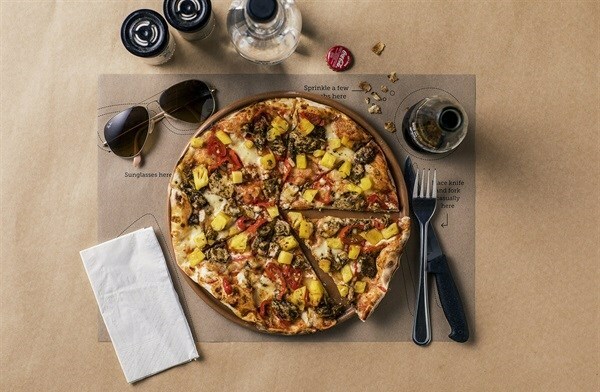 The pizza box uses Col’Cacchio’s conversational tone to mention the different scenarios that may have lead customers to making their purchase, with playful wording like: “Things are about to get infinitely better, I’m piping hot, deliciously delicious, full of surprises and ready for anything."